Happy Kitchen Sink Stamps Monday! While the calendar may say Fall, someone forgot to tell Mother Nature! On Saturday we were in the mid-80's, and are expected to have a few more days in the 80's this week. 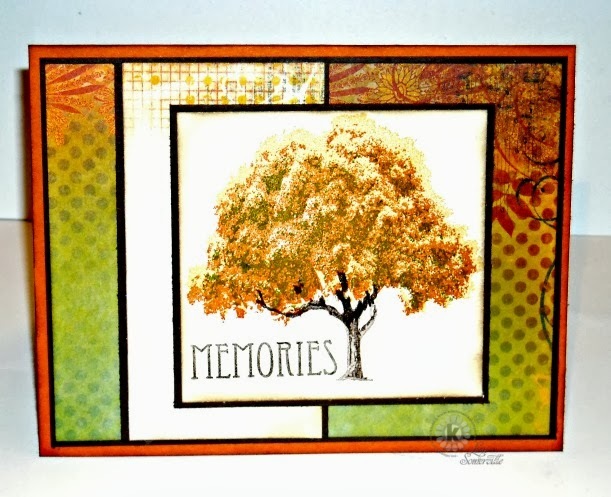 Inspired by the beautiful Bo Bunny Autumn Song pattern papers, and my trees that are slowly changing color, I created my card using Kitchen Sink Stamps Multi Step Trees and Vintage Words stamps sets. You are making me year for Fall...this is so very beautiful!